Backwards Through a Tudor Telescope: Telescopes and "The Common Herd"
In his book Forgotten Scripts the author Cyrus H. Gordon makes an observation that most discoveries are made in two parts. Firstly there is the pioneer who makes the initial breakthrough discovery and then there are either one or many refiners who improve on the initial discovery. We can be certain that Galileo was the refiner of the telescope and we even know the name of the man who first used the term telescope. It was Prince Frederick Sesi of Venice in 1611. Galileo in Sidereus Nuncius (1610) refers only to a spyglass or "the instrument". However, it is less certain who the breakthrough pioneer was. Hans Lippershey submitted his Kijker (looker) for inspection by Prince Maurice Duke of Nassau on September 25th 1608 and on receiving support from the Prince he filed a patent application to the States General in the Hague on October 2nd 1608. Lippershey's patent was declined but he was awarded 900 Guilders to supply the committee with three instruments (see footnote below). Two other Dutch spectacle makers also have been claimed to have been the inventor of the telescope Jacob Metius and Zacharias Jansen. However, the paper trail backs up Lippershey's claim. Prior to 1608 apart from the Digges-Bourne telescope there are accounts of single lens telescopes used by the Italian Raffael Gualterotti based on the works of Della Porta. In his 1593 book De Refractione Optices Della Porta describes in Section XXVI a type of optical tube with a single double convex lens at one end. I think the intention was to create type of camera obscura. Compare Della Porta's drawing (left) with Galileo's (right). Della Porta's device magnifies an image onto a screen whereas Galileo's spyglass has its focal point as the observer's eye. The problem with Della Porta is that he wrote in a very cryptic way that was deliberately hard to understand. When asked about this in 1611 he replied that "the secret was not for the common herd to understand". In later reprints of his magnum opus Magia Naturales (Natural Magic) in 1584 and after (not the 1558 first edition), in Book 17 Strange Glasses Chapter XI Della Porta describes an instrument with a single lens and the spectacle of Ptolemy that could be used to see far away ships. This is similar to the Digges-Bourne Perspective Glass. "I will not omit a thing admirable and exceedingly useful. How blear-eyed people may see very far, and beyond that one would believe. I spoke of Ptolomy's glass or rather spectacle, whereby for six hundred miles he saw the enemy ships coming. And I shall attempt to show how that might be done, that we know our friends some miles off. And read the smallest letters at great distance, which can hardly be seen. A thing needful for man's use, and grounded upon the Optiks. And this may be done very easily. But the matter is not so to be published too easily. Yet perspective will make it clear. Let the strongest sight be in the centre of the glass where it shall be made, and all the sunbeams are most powerfully dispersed and unite not but in the centre of the before mentioned glass. In the middle of it where diameters cross one the other, there is the concourse of them all. Thus is a concave pillar glass made with sides equidistant. But let is be fitted by those sections to the side with one oblique angle. But obtuse angled triangles must be cut here and there with cross lines, drawn from the centre, and so will the spectacle be made that is profitable for the use I speak of." Nick Pelling has suggested that Juan Roget was the inventor of the telescope in Spain and that there are notary accounts of items from the estates of deceased persons in 1593 (Don Pedro de Carolona) and 1608 (Jaime Galvony) that could be spyglasses but the information is insufficient to establish exactly what these items were (http://www.historytoday.com/nick-pelling/who-invented-telescope). 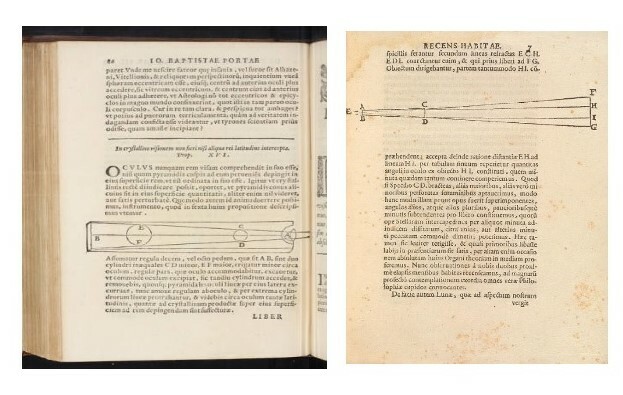 In 1538 Girolamo Fracastoro wrote of experiments with two lenses in his book Homocentricorum Seu de Stellis Liber Unus (Homocentricity or the Book of Stars). But again the descriptions are brief and incomplete. In 1612 Girolamo Sirtori wrote that "it appeared that this conception was in the minds of many men so that once the heard about it, any ingenious person began trying to make one without(the help) of a model". Simply put there were probably a number of optical devices known in the late Tudor period but the starting point for modern astronomy was Galileo obtaining a spyglass from a "certain Dutchman", improving it's magnification and then publishing an explanation of how it he did so in simple language to enable anyone to do the same. Galileo unlike Della Porta wanted very much for his works to be widely read and understood. Could Shakespeare have read a copy of Sidereus Nuncius? 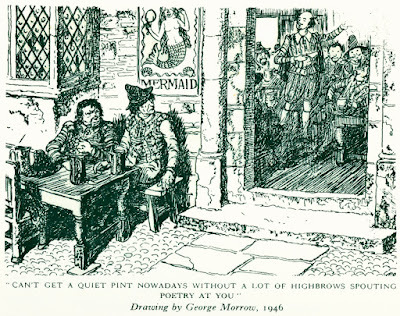 I think the answer is yes and the best place in London to have seen a copy would have been in the Mermaid Tavern.